In the years before the Collinwood fire, educators and politicians re-imagined the public schools as engines of mass assimilation. The public school system, they believed, could teach aCollinwood built Lake View to shape children for life in an economic and political system that many of their families barely understood. vast influx of immigrant children and their families values and behaviors appropriate to modern, urban-industrial life. Cities and nearby towns rapidly built new schools to accommodate explosive population growth from abroad and the school year expanded dramatically. In 1852, Masscachusetts passed the nation’s first compulsory school law, requiring at least twelve weeks of attendance for children from eight to twelve years old. By 1908, most Northern States, including Ohio, had extended the age upward to fourteen and required thirty-five to forty weeks . But schools didn’t just grow; they developed new models of teaching to shape more completely the hearts and minds of children. Through most of the nineteenth century, teaching positions required almost no specialized training, but, by 1900, teacher education and experimental schools flourished. 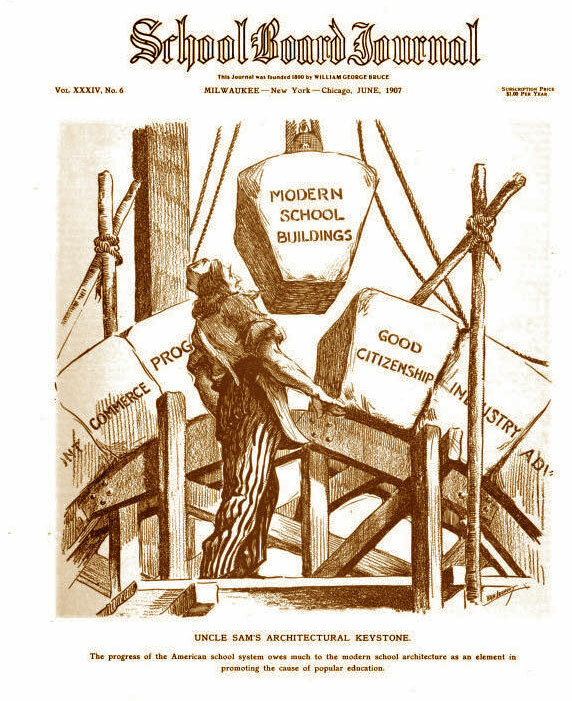 At the University of Chicago and later at Columbia’s Teachers College, John Dewey pushed for programs Uncle Sam guides the keystone of “Modern School Buildings” into place, next to “Good Citizenship” and “Industry.” ASBJ. June, 1907.grounded in emerging theories of child psychology. Dewey and other Progressive educators sought to replace the passive listening, strict discipline, and rote repetition prominent in the past generation with “child-centered” learning that emphasized creativity and experiential curricula. The fundamental role of the school, declared Dewey, was not to implant scholastic knowledge or to create passive compliance through discipline. He also rejected narrow vocational and industrial training schools as “accentuating . . . undemocratic tendencies.” Some employers, he said, would “rejoice to have schools, supported by public taxation, supply them with additional food for their mills” but everyone else—educators, parents, students, and far-sighted business executives—should stand “united against . . . separat[ing] training of employees from training for citizenship, training of intelligence, and character.” The proper mission of the school was to teach children of all classes how to participate thoughfully in a rapidly changing urban-industrial democracy. 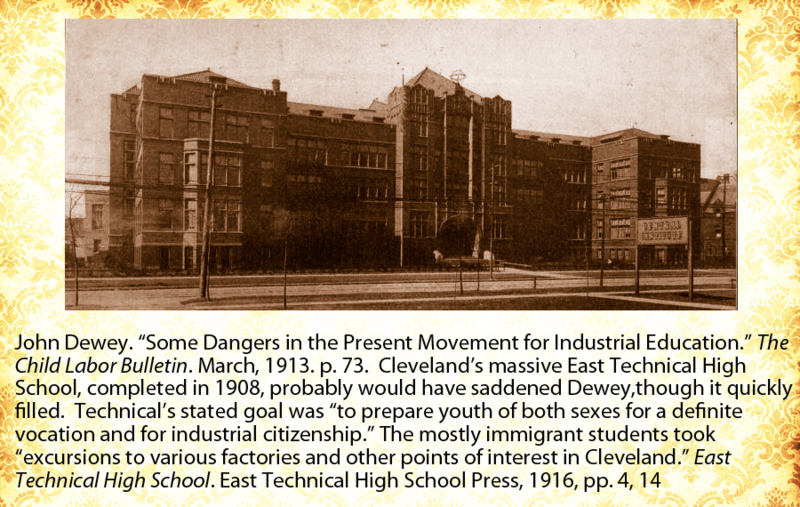 Schools also reached beyond the classroom into the home lives of immigrant families. 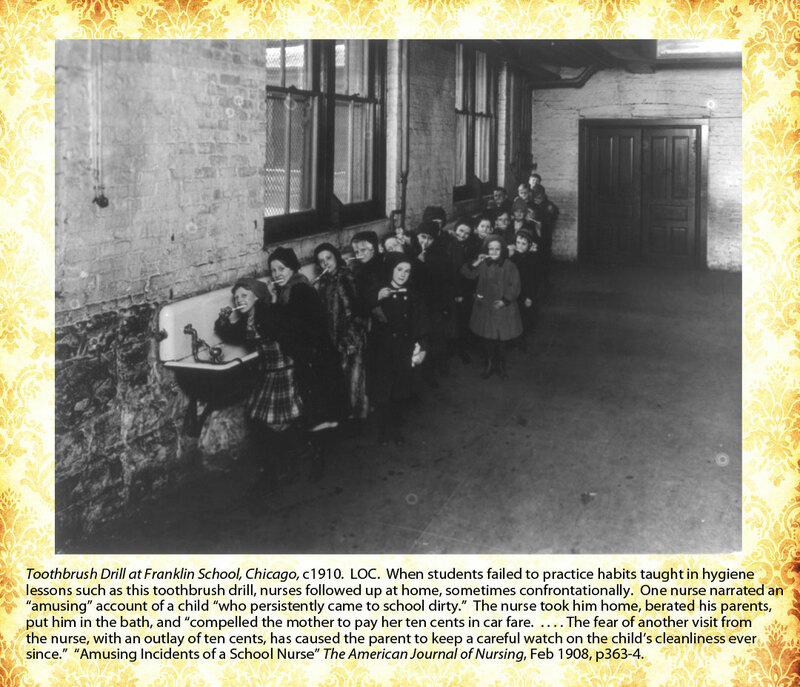 Nurses, doctors, administrators, and teachers monitored children’s health and hygiene, ostensibly to prevent the spread of parasites and infectious diseases through classrooms and tenements. Parents sometimes resented the implications of filthiness that accompanied such teaching, but also modified their familial habits. To ensure consistent oversight of children, not only did states pass compulsory attendance laws, municipalities hired truant officers to enforce them. The new regime of the school no doubt protected some students from the most brutal consequences of urban-industrial life, but, The bedraggled mother and children posed for this photo highlight the school nurse’s impeccable grooming. She is almost certainly there to explain and enforce personal hygiene. Nurses did lower rates of disease and absence in crowded immigrant schools, but it’s easy to see how such a visit might be taken as an insult or intrusion. Luther Gulick, MD. 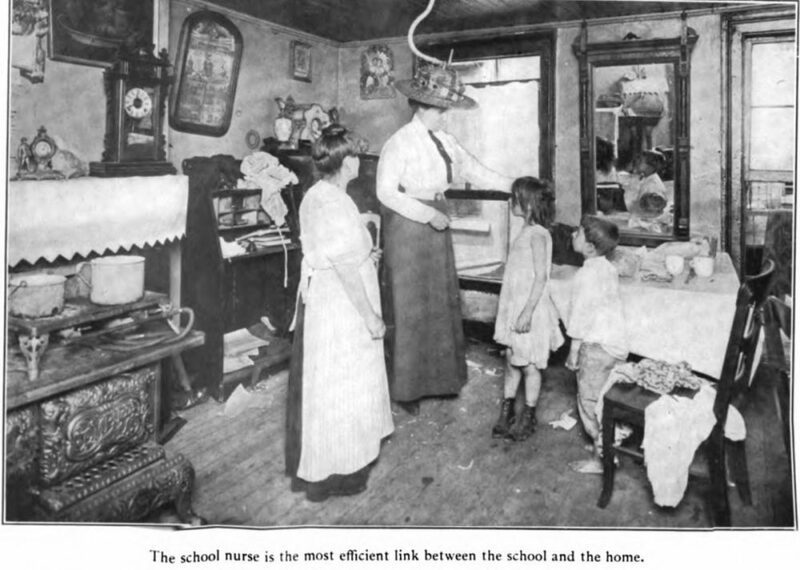 Medical Inspection of Schools, 1913, p67. in a vast expansion of public power, it also sought to mold “unruly” foreign families into workers fit for the new economy. The A Plain Dealer cartoonist drew the tragedy as a smoky question mark rising out of the building’s collapse. How could any parent or child trust a system that compelled attendance in a fire trap? PD. 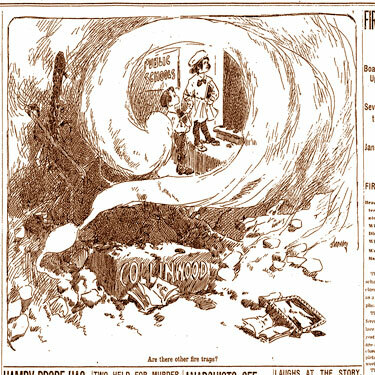 Mar 8, 1908. tragedy in Collinwood needed no ironies of failed ambition to intensify its horror, but people in the town and far beyond it saw them sharply in pictures of the burnt out ruin. In Cleveland, Chicago, New York, London, and Paris, inspectors rushed to examine schools. 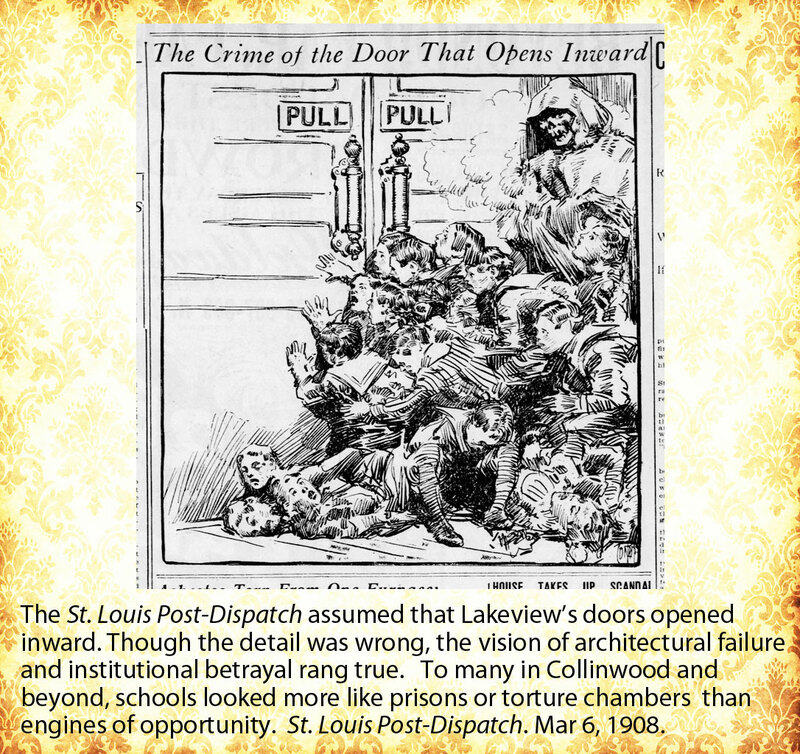 Collinwood built Lake View to shape children for life in an economic and political system that many of their families barely understood. Instead, it collapsed on students jammed against elegantly arched doorways. The bricks, the beams, the glass, the gables, the hope, and the promises rushed downward in a fiery finish. Compulsory attendance had never looked so bad.